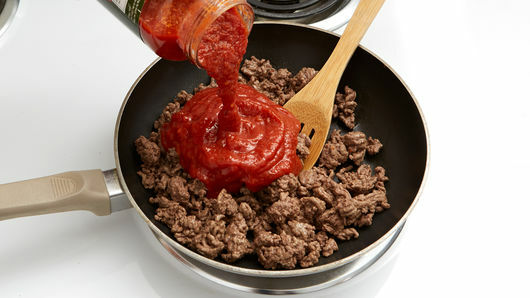 In 10-inch skillet, cook 1 1/2 lb ground beef over medium-high heat, stirring frequently, until brown; drain. 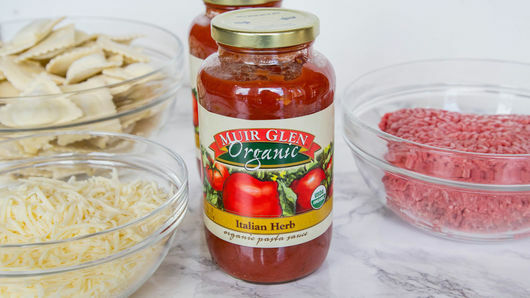 Stir in 2 jars (25.5 oz each) Muir Glen™ organic classic marinara pasta sauce. Spread 1 cup sauce mixture in baking dish. Have ready 2 bags (18 oz each) frozen cheese ravioli and 2 cups shredded mozzarella cheese (8 oz). Place 1 layer frozen ravioli evenly over sauce in baking dish. Top with one-third of the remaining sauce and one-third of the cheese. Repeat for a total of 3 layers. Cover with foil. Bake 40 minutes. Remove foil; bake about 5 minutes until cheese is melted. Serve garnished with 2 tablespoons chopped fresh basil leaves. 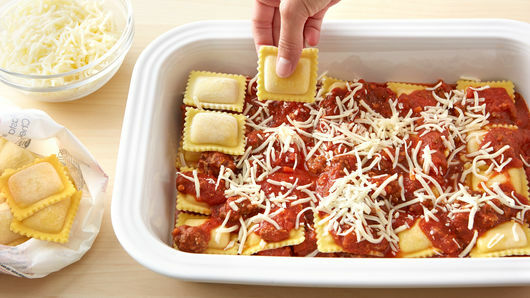 For a quicker baking time, use fresh ravioli from the refrigerated section of the grocery store. Make ahead; cover and store in freezer. Thaw in the fridge overnight, then bake until bubbly and hot. Though nowadays there are so many shapes, sizes and fillings for ravioli, the traditional recipe features square-sized ravioli filled with ricotta and is served with a red sauce. Some experienced home cooks will make the pasta dough from scratch and form the ravioli squares by sandwiching two sheets of dough together with the filling inside, and then cutting with a pasta cutter into individual squares with wavy edges. 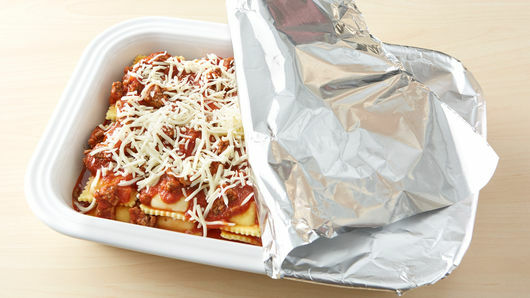 There is no shame in buying frozen or refrigerated ravioli, though! It makes a great quick fix for dinner, and tastes just as good as the scratch stuff. 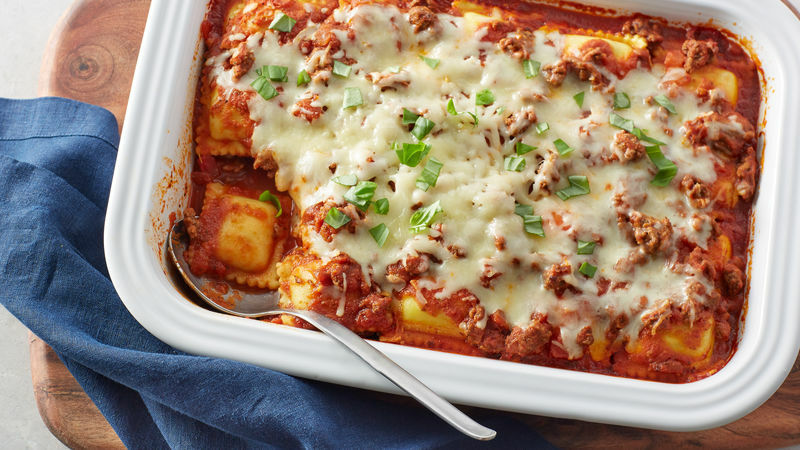 And when it’s taken up a notch, like in this baked ravioli casserole that’s reminiscent of lasagna, it tastes even better. We can’t just stop at this quick casserole, though! There are many ways to enjoy ravioli beyond just tossing it with sauce, and they can all be found right here .